I used to play the violin. I really enjoyed it. However, there was something that was very clear to anyone listening to me playing, who perhaps would not have enjoyed it quite as much. The sound which came out of the violin, might have been technically “similar” to the music on a sheet in front of me, but it didn’t sound perhaps quite like the composer intended. The tuning wasn’t that perfect, neither was the vibrato technique I used. However, there is something, I wouldn’t have thought of, that is to use the humble violin in a totally different context from music: in the visual arts. I recently visited Amsterdam to meet clients. In some of my downtime, I came across a “violin” based artwork pictured above in the lobby of a hotel. The hotel used to be a music school, so even someone as artistically devoid as me can see there’s somehow a link. 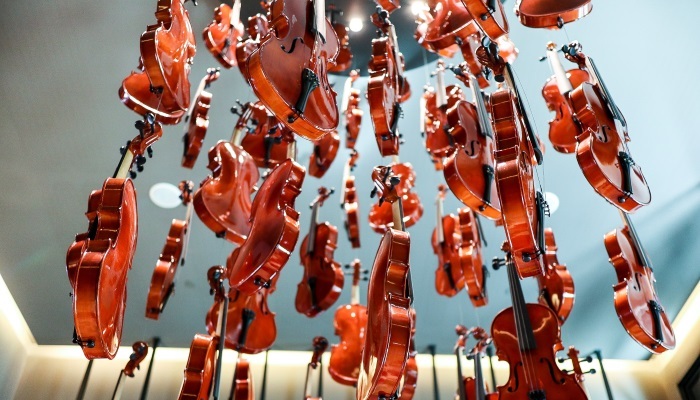 The idea is pretty simple, hang some violins in a pattern by strings. That’s it. But somehow, the artwork, just “works”. That’s the thing with art. Often the idea behind art doesn’t need to be complicated. It just needs to look cool (or perhaps in more art-like speak “aesthetically pleasing”). However, very often the “old way” of finding trading ideas (ie. in real life) is just as good. Working with a great team at a financial institution, can be a great way to develop your trading approach to markets. Furthermore, working in a team, you might produce something that none of you individually would have thought of (an obvious point, I know). I feel somewhat lucky that I began my career at Lehman Brothers (not obviously because of how it ended…), but because I was lucky enough to be surrounded by very smart folks on my team, who wanted to teach me. Later on in my career, I’ve also learnt a lot from the people I’ve worked with. I really hope, they’ve learned from me as well.. but you’ll have to ask them about that! Somewhat ironically, in the age of the Interest, one thing that has really exploded, is the concept of meetup events (meeting real people! ), helped by the establishment of Meetup.com. Take for example the Thalesians, a quant think tank which runs quant events in London, New York and Budapest, which I helped to co-found. It provides a great way to network with other quants and to learn about new ideas from experienced practitioners and academics. More generally, it is not the case, that everyone will tell you their precise trading algorithms (as you might find in books), nor should they. However, very often I find it’s not necessary the case that the inspiration for a trading strategy needs to be fully formed. Often it can literally be something which somewhat said, perhaps something you’ve seen briefly, maybe a chart on Twitter, some price action you’ve observed on Bloomberg etc. The original start of a the process of developing a trading strategy, can often be a hunch, something which you seem to spot in prices. It doesn’t always end up “working”, but I’ve been surprised at how often this approach has worked for me. Watching markets is NOT a waste of time, if you’re a quant. I’m not suggesting you watch a Bloomberg terminal from dusk till dawn (there’s no time left for research or coding then…), but having a feeling of what’s happening in markets, can help you identify what factors to model. So creativity shouldn’t just be limited to artists. Quant traders need to get creative and most importantly, find inspiration! I’ve never really believed in the idea of a brilliant trader who sits in a room with nothing. The best traders ask the right questions, and listen for an answer!